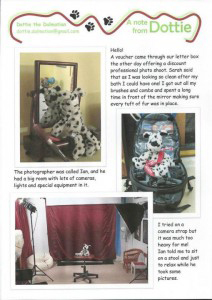 The Dottie project came about after we mentioned briefly to some volunteers we would love a regular character regularly writing to the children. Different volunteers over the years had sent cards from toys and animals including Beddy Bear and Percy the Poodle which had always proved to be popular. After research and discussions Dottie was born. 5 years later Dottie has sent more than 101 adventures. The biggest highlight of Megan’s life so far is litter mate Rufus, he goes everywhere with Megan, he even shares her bath water. We have set up a facebook page to keep everyone updated on Rufus’s travels. 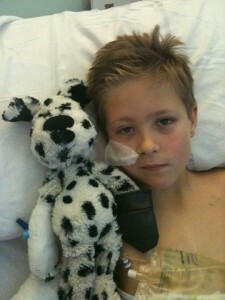 He’s having some lazy time at the minute before he will be very busy looking after Megan when she is in hospital. William S’s mum found William like this one day – he said he wanted to be like Dottie and litter mate Daniel! 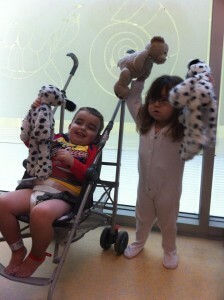 Littermates frequently go into hospital with the children and have medical procedures done on them, both Aled and Dottie had matching PICC lines. The toys are such good quality they have never had a scratch on them, but Megan fell asleep with Rufus the night before her spinal surgery and when they woke up they found Rufus’ back had come open – the same place as Megan was having stitches that day! My daughters Tyler and Megan tell litter mate Amelia about their angel sister Madison and take the letters to her grave to read to her, they show Amelia pictures of Madison and tell Amelia about her. It has been hugely popular and over a year later all the children are still extremely excited when a letter comes through the door with paw marks on the envelopes. Postcards and TLC cards are sent too. 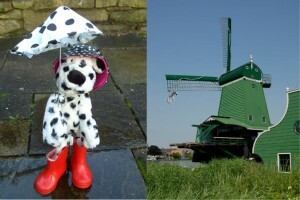 This postcard is from Dottie’s holiday to Holland – she got a little too close to the windmill and when she went splashing in puddles in those april showers! To celebrate a year since the start of the project, all the children received a party bag to celebrate the litter mates birthdays. The children got very excited and all held parties and some even baked cakes for their litter mate. Here are photos sent from families – Emma and Amber with Rosie Dog, Bottomly Pots (Seraphina’s family) and Daniel Dalmatian (William S’ family). Lightning is never far from Nico’s side. It is great this was one thing that ‘Alicia didn’t have!’ is what he says and it makes him feel special as normally his sister had the treats as she was very ill (later passed away). He loves getting the letters and knows when one comes. Lightning goes on day trips and holidays with us. 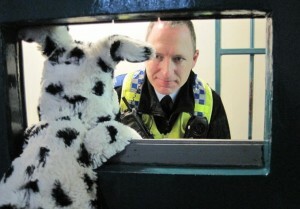 Dottie even got arrested (but was later found innocent!) and she has also been our on life boats, met Peppa Pig, collected eggs before decorating and planting cress in the shells (and sending cress seeds to her litter mates), she went on a camel ride in Lanzarote and has made lots of new friends along the way! 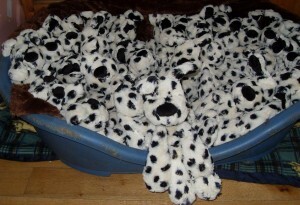 The Dottie project is expensive to run – the Dalmatians themselves are £16, the cost of printing fortnightly letters and cards combined with postage do come to a lot, but the families reactions make this use of donations very worthwhile. It was initially funded by the kind members of Maggot Drowning and donations in memory of Lewis R but has no ongoing funding. 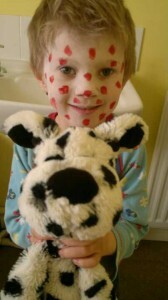 If you would like to help by making a donation to the Dottie project you can via our donate page. 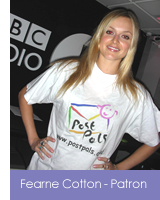 You can also buy Dottie project products ranging from greeting cards to calendars from http://www.dottie.org.uk and follow her on Facebook! 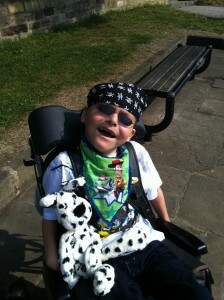 “A big thanks to all the lovely people that have helped him through this, not forgetting Dottie, who he is cuddled up in bed with as I write this” Connor’s Mum shortly before he passed away.